Re: Recommend a Wind Turbine? As a matter of interest, other wind generator manufacturers present their output figures based upon a Weibull distribution of wind speeds. 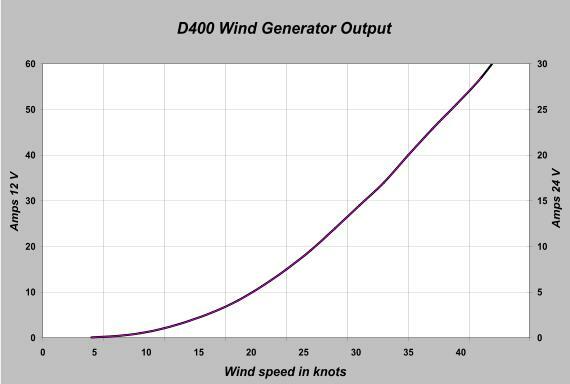 A Weibull calculation determines the "power weighted average" wind speed at a location by observing the wind speed over an extended period, i.e. one year. Since the power extractable from wind increases with the cube of wind speed, a Weibull calculation relies heavily on infrequent higher speed winds to determine available energy. A Kiss wind generator located on a site with an average wind speed of 15 knots, would, by Weibull calculation, claim output of 16 amps average over a year. I would argue that, particularly on a sailboat, this calculation is of little interest. We try not to stay in one location for a whole year; we don't have the storage capacity to store weeks worth of power; and we try our darndest to avoid those periods of very high wind. Typically, what we are interested in is the actual output at a particular wind speed." What ever Wind Turbine you get. Make sure its not this one. Just listen to this lady. She thinks its just dandy keeping the neighbors awake. I recently purchased a Silent Wind gen from Spreco. Wish I could give you a first-hand review, but it's still in the box, and won't be installed for a couple more months at least (all the water is too hard up here right now). I can tell you build quality seems excellent, but that's all I know for sure. - Is rated a good performer, particularly at lower wind speeds. - Is "quiet", although that seems to be a highly subjective factor. I would probably have gone with a D400, but it too heavy for our setup. I also seriously considered the Airmaax, but when I attempted to get more info from the company I was met with no response. Too bad, b/c they look good. Anyway, I believe we've made a good choice. I plan to write a full report back here after we've had it whirring away for a few months. Following the pointers given I have done some leg work and the D400 looks a very good option! They also supplied the 50mm stainless pole and the the machined mount which goes into the top of the pole. Good service and provided good advise. The lady in that video should never be allowed to talk to a camera ever again. On a Budget, I vote for the AIR BREEZE and if money was no option then the D400. Love my Superwind. I can stand at the helm and hear other units hundreds of feet away but not my own. I can't believe folks put up with, or ever get used to that racket! The blades feather in a gale, and the controller accepts up to a 145 watt solar panel installed downstream. $2100, but earned $90 in certificates ordering through WM. D400 vote from me too. Heavy. Not too noisy and powerful. How heavy is that Canadian new toy btw? I purchased the KISS generator for my boat 8 years ago and when I have had to work on it, it was simple and easy to do. Good output with 10 knt's of wind. It works so well that I had to put a heat sink on my water heater to take some of the power overload it produces. Reasonable cost and works in very high wind. I have four 8-D lifeline agm batteries and two series 27 engine batteries and a smart charger. I also have three 120 watt solar panels which is overkill but works well with the gen. set. kingwoodie can you give me some performance data on your KISS wind turbine (WT)? What is the blade diameter? How many amps does the unit produce at different wind speeds? Are you using a common charge controller for the WT and solar panels? Does the KISS output AC power that a rectifier converts to DC? Any data would be useful for me to compare to my Apollo WT system. windabled: Go to kissenergy.com for all the charts. This generator is made in Trinidad and is designed for the heavy winds of the Caribbean. I purchased mine about 8 or 9 years ago and sailed with it around the world. Always worked and helped to keep my four 8d agm batteries charged. With my three solar panels and the kiss generator I very seldom had to use my gen set to charge with. The main thing I liked about this wind generator is that you can fix it with ordinary electrical car parts. The guy that makes these sets has his phone number in the web site. Call him and he can tell you what you need to know.